Uncertainty As A Discipline Of Aliveness, Loops, And... Coffee. Uncertainty As A Discipline Of Aliveness, Loops, And… Coffee. JD.com Update — An update on where we think JD.com can go from here. Red Teaming — A review of one of the most important analysis techniques we utilize at Macro Ops. 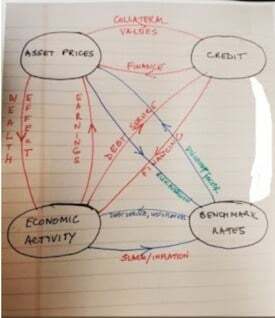 Thiruvadanthai does a great job of exploring the more important of these feedback loops, those of monetary policy origins. Here’s an excerpt. However, in the real world, the expectations of financial market participants can diverge from the expectations of business executives making capital spending decisions. So, if financial market participants take a rosier view of the future, they can bid up asset prices, but, to the extent business capital spending decisions are driven less by cost of capital and more by demand, business executives may see limited opportunity for fixed investment. In that case, the economy may remain tepid, the Fed will remain accommodative, supporting the asset price speculation. Moreover, to the extent the real economy has considerable slack, the Fed has the freedom to address financial market turmoil, or the Fed Put is closer to the money. In some ways, this describes the situation of the past several years. On the other hand, if the real economy is booming and/or inflation is high, the Fed, driven by real economy considerations, may be constrained in its willingness to pay obeisance to every market hiccup. The Fed Put would be further out of the money. It’s a quick and worthy read. Here’s the link. Oh… and also check out this short but great interview with Druckenmiller from 1988. Here’s the link and h/t to @teddyvallee for the find. My guest is Boyd Varty, who grew up in the South African Bush, living among and tracking wild leopards. The main theme of our conversation is tracking, and how the same strategy for pursuing animals in the wild can be applied to all aspects of our lives. Boyd’s family has been tracking animals for four generations, and he is bringing what they have learned to a larger audience around the world. This was an older talk that was reposted. I had skipped over it originally because in one of my previous jobs I had spent a considerable amount of time learning to track, from some of the best in the world. And so I wasn’t really interested in hearing more on the subject. At least until a number of you guys recommended it to me and so I finally got around to it and I’m so glad I did. The talk has very little to do with actual tracking — although there’s some amazing stories about tracking in it. But Boyd really uses the concept of tracking to discuss the principles for living a good life. One that’s in accord with nature. My favorite bit was his idea of viewing “uncertainty as a discipline of aliveness”. Not only accepting the uncertainty of nature and life, but learning to harness that to one’s own advantage. Anyways, if you haven’t already, I suggest you give it a listen. It’s that good. Here’s the link. This week I read an older trading book called How I Trade and Invest in Stocks and Bonds by Richard Wyckoff. The book was first published in 1922 and most of you should be familiar with the name of Wyckoff. He’s one of the original OG traders that came up in the heyday of speculation. Along with the likes of Keene, Livermore, and Baruch. I can’t remember if I read this book years ago. I probably did. Either way, it’d been long enough to where this a fresh read. It’s a good book on the foundational principles of speculation. And I just personally, enjoy reading old investing books and this was a fun one. Here are a few of his trading principles. They are as true today as they were then, nearly 100 years ago. THE MAIN FACTOR IS THE TREND. If you work in harmony with the trend of the market, your chances for success are three or four times what they would be if you buck the trend. That is, if you buy in a bull market, the trend will, under ordinary circumstances, give you a profit; but if the trend of the market is downward, and you take a long position, the only way you can get out is on the incidental rally. This brief statement covers the point about as well as could be done in many chapters. RISK SHOULD ALMOST INVARIABLY BE LIMITED. Not only the experience of those whose trading I have observed but my own experience proves that whenever one departs from this general principles he is inviting serious losses. The best way to limit your risk is to form a habit of placing two or three-point stops behind anytrade which is made for the purpose of deriving a profit from the fluctuations. Harriman contended three-eights of a point, or one point, was enough; but of course he was originally a trader on the floor of the Stock Exchange. The most successful traders have followed this rule and its importance cannot be overestimated. ANTICIPATED PROFITS SHOULD BE AT LEAST THREE OR FOUR TIMES THE AMOUNT OF THE RISK. It must be expected that a percentage of your transactions will show a loss. The trader should aim to have such large profits on his successful trades that the losses and other expenses will still leave him something to the good. Profits can often be protected by moving stop orders up or by selling one-half of the commitment in order to mark down the cost of the remaining half. ONE SHOULD BE ABLE TO DEAL FREELY ON BOTH SIDES OF THE MARKET. Any one who is unable to do this had better become an investor instead of a trader, buying in panics or on big declines such securities as appear to be selling below their intrinsic value. YOU SHOULD EITHER MAKE A BUSINESS OF TRADING OR ELSE NOT TRY TO BE A TRADER. You cannot be succesful at trading any more than you can be at mining, manufacturing, doctoring or anything else, unless you are trained for it. And by “training” I do not mean an occasional dab. 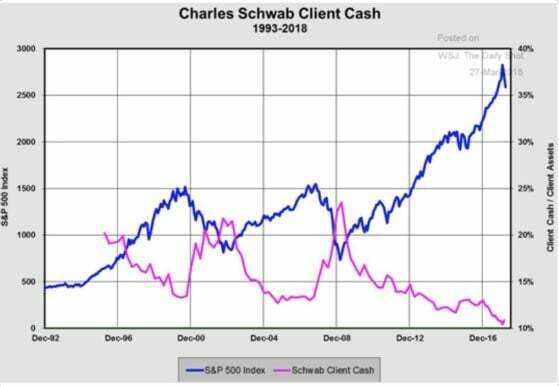 Incidentally, unless you are peculiarly adapted to the business you had better become an intelligent investor instead of an unintelligent trader. So Starbucks (SBUX) has an interesting chart. The one below is a monthly. The stock has been trading in a tight horizontal channel for nearly 3-years. Tight sideways action like this, over a long period, often precedes a big move. It’s mobile payments app saw payments grow over 75% year-over-year in 17’. China’s middle class (where Starbucks is seeing the majority of its growth) is expected to double over the next 5 years, from 300m to 600m, according to McKinsey. The Chinese are just developing their affinity for coffee and it looks like Starbucks may have an increasingly large runway in the company. I’ve still got a lot of digging to do. The company has seen sales and cash flow growth stall out some over the last year. So I need to figure out why that is and if it’s likely to continue. 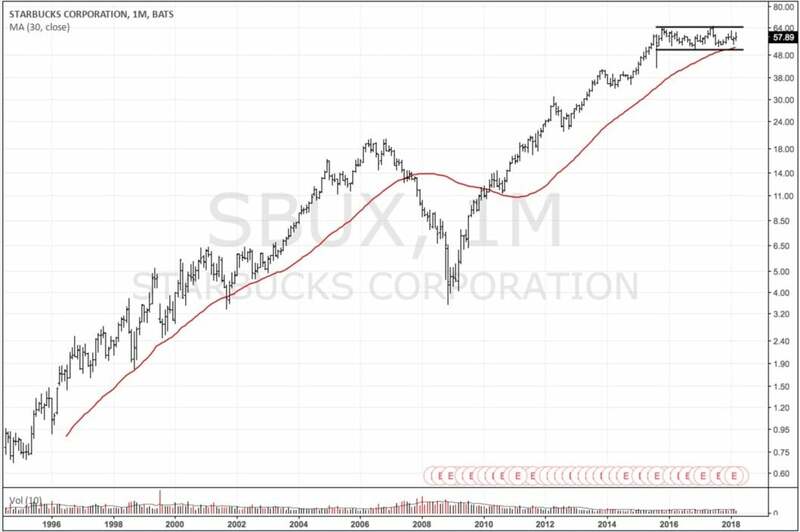 But if there’s a play here, SBUX could be a good candidate for our DOTM call strategy. Understanding the prevailing beliefs of market participants about how they think the world works is almost as important as understanding how the world actually works.